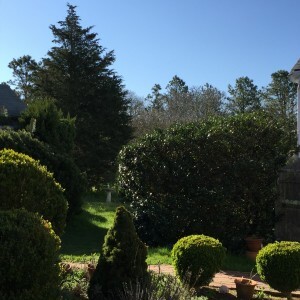 The Broad Meadow Bed & Breakfast is centrally located on the Island of Martha’s Vineyard in a lovely space that was completely renovated for its opening season almost seven summers ago. The room includes a parking pass to the one of the prettiest beaches in the world: Lambert’s Cove Beach on Vineyard Sound, just over three miles away. We also offer guests a parking pass for The Trustees of Reservations Long Point Wildlife Refuge, an extraordinary stretch of silky sand beach on the Atlantic Ocean and a pond over the dunes where there is swimming for all ages. Another nearby popular place to swim is at fresh water Seth’s Pond and Ice House Pond. The West Tisbury Town Tennis Courts are but a mile away and and can be accessed by a modest fee paid to the Town. Guests delight in quiet time spent on The Broad Meadow grounds, in the hammock or sitting on a bench watching the world of meadow and gardens. 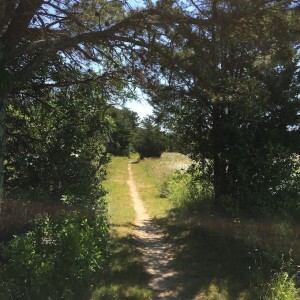 We are a few feet from Martha’s Vineyard’s major bike path which circles the entire State Forest, and connects with other paths heading into Edgartown and along the beaches between Edgartown and Oak Bluffs. Bring or rent bikes on the Island for short or long rides around the interior of the Vineyard (there is a good pump on our premises). The Martha’s Vineyard Airport is two miles away on the bike path, a fun destination for biking to lunch at the Plane View Restaurant and watching small planes fly out and in. The bike path is also a favorite for runners and walking. Many other walking trails are nearby, including a Sheriff’s Meadow Conservation Society path through Nat’s Farm which abuts our meadow and an adjacent field. Walk down Elias Lane and cross over to an ancient way, Old Courthouse Road, which takes one by a charming field and stream to North Tisbury. Or cross over the field on a Martha’s Vineyard Land Bank path and walk to the Polly Hill Arboretum. The Broad Meadow Bed & Breakfast is hosted by Marjory Potts. She is a writer, and with her late husband, Robert, made educational and documentary films and for many years published a local paper on West Tisbury and Island politics and other news. 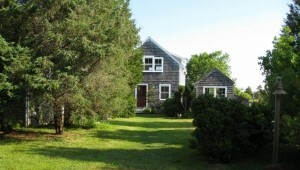 She has been a year round resident of West Tisbury for over thirty years and a summer resident long before. Marjory will be happy to help you in finding your way about the Island so that your vacation is as meaningful as you could wish. Please link to TripAdvisor to read our wonderful reviews.